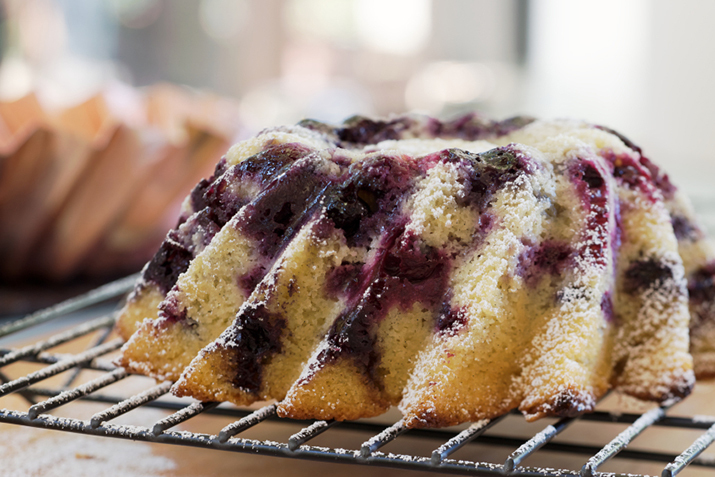 This rich sour cream coffee cake can be made any time of the year, thanks to the wide availability of frozen blueberries. Preheat the oven to 350°F. Grease and lightly flour a 9-inch bundt pan. In a large bowl, cream together the butter and sugar. Beat in eggs, one at a time, and stir in sour cream and vanilla. Combine flour and baking powder and stir into the batter. Gently fold in the blueberries. In a small bowl, combine pecans, brown sugar, and cinnamon. Fill the bundt pan with half the batter, sprinkle in half the pecan mix, then pour in the remaining batter and top with remaining pecan mix. Use a knife or fork to swirl the pecan mix into the cake batter. Bake 60 minutes, or until a knife blade inserted in the cake comes out clean. Cool in the pan on a wire rack and dust with powdered sugar before serving.